NEW YORK, New York — Since 2009, several infrastructure- and community-development projects have significantly improved the quality of life of the Ditavan community, a village in Armenia’s Tavush region. With an opening ceremony held on July 26, the Armenia Fund unveiled still another measure undertaken on behalf of Ditavan inhabitants: a newly built potable-water system. 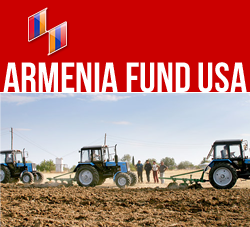 Sponsored by Mr. and Mrs. Armen and Nadia Ekserciyan of Argentina, Benefactor Members of the Fund, the 97 million AMD network spanning 3.5 kilometers will provide around-the-clock drinking water service to Ditavan’s nearly 120 households. Following the opening ceremony, the Fund’s Public Relations department presented 415 books to the Ditavan public library, donated by the Safrazbekian family. Apart from the potable-water initiative, the completed projects in Ditavan include a natural-gas network, an irrigation system, a community center that houses the mayoral offices, a health clinic, a public library, and an events hall.